Panda! 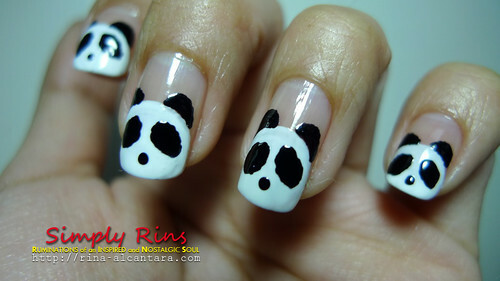 Or should I say, pandas! The design actually reminded me of a group of friends I used to hang out with a few years ago when I was still into online games. 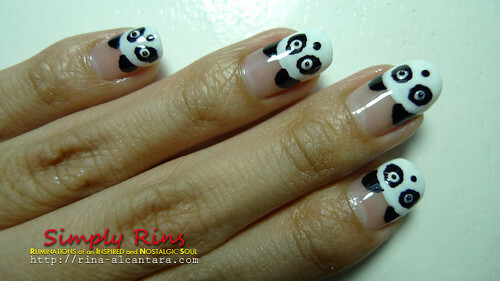 We had a friend who was into pandas. I never really gotten to ask him why. Maybe he found them adorable? Who wouldn't! Anyway, eventually, the group was tagged Team Panda. And now, they're on my nails. I miss them. Hopefully, we could all get together soon. and black nail art with tip. First, I applied a layer of base coat. 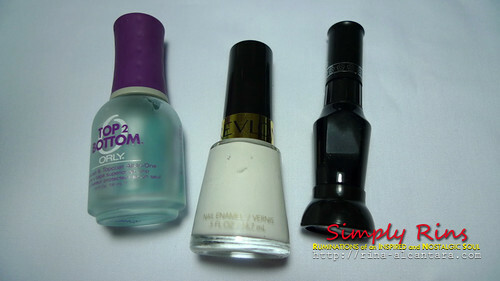 Then I painted the a semi-circle shape from the nail tip to midway of the nail using Revlon White on White. This was done with 2 coatings. I allowed this to dry for about 5 mins. I then drew the ears, eyes, and nose with the black nail polish with tip. and the Revlon White on White. For the center of the eyes, I added black tiny beads. I was thinking of just using the dotting method but I figured the beads would be more interesting. I allowed everything to dry for about 5 minutes before applying a layer of top coat. I was very careful in applying the top coat lightly, so as not to smudge the black polish. 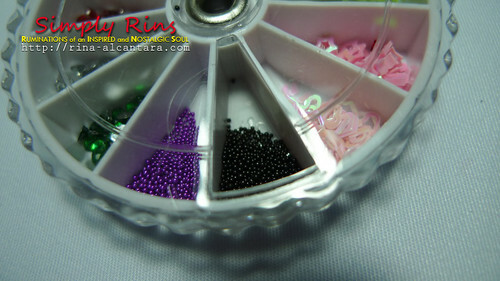 The small black beads that were used for the eyes. Please read Nail Art: Cupcakes for personal tips on how to pick up tiny beads. 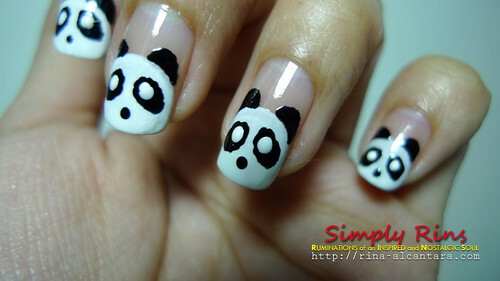 Sadly, pandas are among the endangered species. Let's help save the pandas! 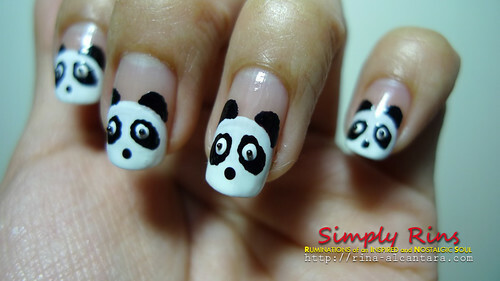 The World Wildlife Fund (WWF) is an organization that's active in preserving the pandas. 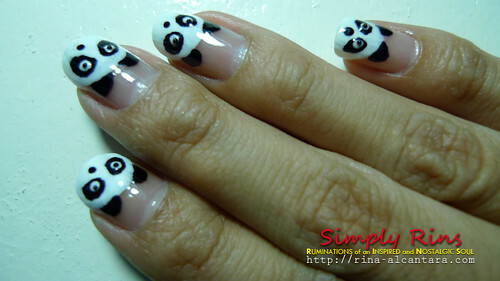 They have provided several options for people to help in saving the pandas. One option is to Adopt A Panda. This is actually just a symbolic panda adoption. You'll be able to choose from a variety of panda apparels or stuffed toys. After purchase, you'll be given an adoption certificate. Another option is to get an approved WWF Visa Signature credit card from Bank of America. The bank will contribute $100 to WWF for each new qualifying account. The credit card will have a panda watermark. But donation is not the only way to help. Creating noise about the fact that pandas are at the brink of extinction would be helpful too. This will spread awareness and hopefully will put an end to those people who hunts pandas and those that abuse their natural habitat. 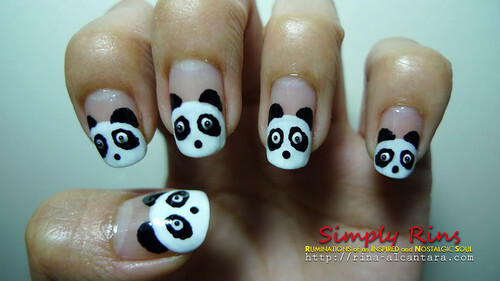 The pandas on my right hand. I hope you liked today's nail art design. yey! I recreated them on my blog! :) I hope you could see it too!